The Hyundai Ioniq comes in three electrified versions. Hyundai Motor Co. is challenging the hybrid-car leader by touting the low center of gravity, rigid body, sporty suspension and fuel-saving lithium ion battery in its new Ioniq. The list of specific selling points clearly targets the redesigned Toyota Prius. Toyota Motor Corp. has trumpeted many of the same qualities in the makeover of its flagship hybrid. The showdown with the Prius is coming soon, with the vehicles to compete on not just fuel efficiency, but drivability and handling as well. The Prius went on sale in December in Japan, and the Ioniq will be released this month in South Korea. 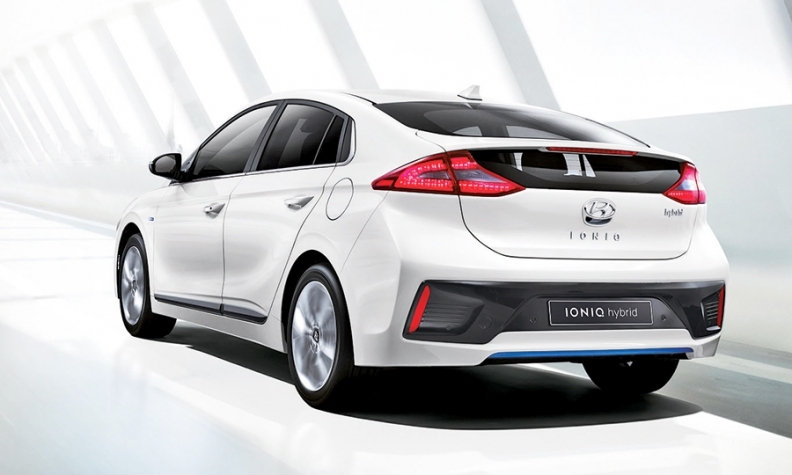 The Ioniq will be offered in three electrified versions: a standard hybrid, plug-in hybrid and all-electric variant. As in the Prius, Hyundai positioned the battery under the rear seats for a lower center of gravity. Engineers applied lightweight, high-strength steel to 53 percent of the body to boost rigidity, and they trimmed weight with an aluminum hood, tailgate and suspension parts. The Ioniq's 1.6-liter Atkinson cycle engine achieves a thermal efficiency rate of 40 percent. Toyota has called the 40 percent rate of the new Prius the highest of any mass-produced gasoline engine. Most engines are about 25 percent efficient. The Ioniq is poised to top the Prius' 121 hp. The engine delivers about 104 hp, while the electric motor chips in some 43 hp, implying a combined output around 147 hp.